A tradition of high-speed operation on the ECML has been encouraged by long sections of straight track and gentle gradients. Edinburgh is the northern end of the ECML, although the long-distance franchise operator has services west and north from the Scottish capital. An important interchange, Network Rail-managed Leeds station has been radically remodelled. A marked growth in passenger numbers was experienced. After years of decline, freight has recovered on the southern ECML section, also heavily used by First Capital Connect services south of Peterborough. Extra platform faces scheduled for Peterborough will help alleviate conflicting movements at this busy station. The King's Cross improvement project will run up to 2013. This southern concourse in front of Cubitt's façade will be replaced by a larger one to the west. National Express East Coast will inherit GNER HST and Class 91/Mark 4 trains pending replacement under the Intercity Express Programme from 2012. Hull Trains Class 222 (seen at Biggleswade) is joined on the East Coast by another open access operator, Grand Central, from 2008. Grand Central operates a Sunderland-London service with High Speed Train sets. Breaking News: The UK’s East Coast Main Line is to receive an investment of £240m to improve capacity and reduce journey times. The investment is part of the UK Government’s recently announced £9.4bn rail investment plan to improve the rail network in England and Wales. An upgrading programme for the 393-mile (632km) East Coast Main Line (ECML) route between London and Edinburgh, and its key divergences serving Leeds, Bradford and Glasgow, was thrust into a new context during 2007, when its principal intercity franchise also fell into new hands. The publication of government spending priorities, ‘Delivering a Sustainable Railway’ and a change of principle passenger operator reshaped the future of this key UK rail artery. "Main freight operators such as EWS, Freightliner, Direct Rail Services and First GBRf all have a presence on the ECML." Electrified with a 25kV ac overhead supply in stages between 1976 and 1991, ECML lines have experienced traffic growth in most sectors, although operational problems have become accentuated. High demand has led to passenger overcrowding across long distances. The line is prone to problems with overhead line equipment, with resultant service curtailments, often attributed to the lightweight nature of the original electrification scheme. With a new UK north-south high-speed line ruled out by government for the foreseeable future, the ECML and its West Coast Main Line (WCML) counterpart, nearing the end of a major upgrade, will therefore be placed under greater pressure in meeting the projected demand increases. Great North Eastern Railway (GNER), the ECML’s long-distance passenger operator since 1996, surrendered the franchise to National Express in December 2007. The now-familiar GNER dark blue and red train sets are to give way to a new all-over white, akin to Germany’s ICE. "GNER became the first UK train company to offer uninterrupted Wi-Fi internet connections for all passengers, both first and standard class." In spite of overseeing a marked rise in passenger numbers and increasing services, problems were caused by the financial difficulties of GNER’s Sea Containers parent company and the franchise awarded to them in 2005 was cut short by the government. Long associated with high speed thanks to several long stretches of straight or gently curving track and few severe gradients, the rapid centre-to-centre ECML services are highly competitive with road and air alternatives. It is not until Newcastle that air offers a realistic high-volume alternative to passengers on the London route. The modern ECML is characterised by the many companies and services that share the route. South of Peterborough and growing more intensive nearer to the London King’s Cross terminus, First Capital Connect has held the inner and outer suburban franchise since 2006. Another significant ECML presence north of Doncaster is the long-distance cross-country franchise operated by Arriva (Virgin before November 2007). Northern Trains, TransPennine Express, First ScotRail and Stagecoach East Midlands (Central Trains before November 2007) also use parts of the ECML. Hull Trains has successfully filled a vacuum created by the sparse GNER service to the city. After several delays, a second open-access operator, Grand Central, will add HST services originating in Sunderland to the ECML south of Eaglescliffe (near Middlesbrough) from the beginning of 2008. Overshadowed in freight volume by the WCML, the ECML nevertheless has seen growth in this field, even at the southern end where previously it had been in steep decline. Main freight operators such as EWS, Freightliner, Direct Rail Services and First GBRf all have a presence on the ECML. There are plans to create a new London north orbital passenger railway by reopening the line between Oxford and Bletchley for regular use. Before its demise, infrastructure operator Railtrack was planning to spend up to £1.6bn during ten years to remove operating constraints. A £165m reconstruction of the Leeds station area and track layout was completed. The only other completed major project is the Allington Chord to remove Nottingham-Skegness services from the main line. Railtrack’s successor, Network Rail, will oversee other scheduled ECML works. Its Route Utilisation Strategy Draft for Consultation of June 2007 forecasts up to 54% increase in passengers on long distance services, with up to 21% on London commuter routes. Although some earlier intentions, such as removing Newark flat crossing and quadrupling Digswell (Welwyn) Viaduct and Peterborough-Huntingdon have apparently receded, the ECML remains set for significance improvements. In addition to an already approved £400m King’s Cross project to markedly improve and increase passenger accommodation up to 2013, an extra platform will be added. A flyover at Hitchin will allow services down from Cambridge to leave the main line without obstructing other ECML movements as at present. 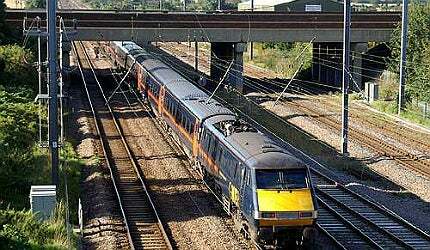 Peterborough, 80 miles north of London and on the limits of outer suburban operations, is to receive a much-needed extra island platform to allow more segregation of East Anglian-Midlands passenger and freight paths from those for the ECML. National Express East Coast operates a fleet of 316,090hp (4,540kW) Class 91 locomotives built by BREL at Crewe Works. After patchy initial performance, reliability was greatly improved by a re-build carried out at Doncaster. The project encompassed a 125mph line between London, Birmingham and Manchester, with incremental improvements elsewhere. Designed to run at 140mph (225kmh) but limited by the infrastructure to 125mph (201km/h), these work in push-pull mode with nine-car Mark 4 coaches, plus driving van trailers built by Metro-Cammell. Introduced from 1991, the Mark 4s were refurbished from 2004 under Mallard branding, an allusion to the line’s high-speed heritage. The chamfered bodysides of the Mark 4s have proven to be an unnecessary intrusion into passenger space, as the tilt mechanism for which the shape allows will never be fitted. Diesel 125mph HSTs are used to serve non-electrified destinations (Hull, Harrogate, Inverness and Aberdeen) and, although fully under the wires, to cover some of the increased frequency to Leeds from 2007. Their formations have been lengthened with an extra coach and an internal refit to match the Mk4s began in 2006. The power cars are being fitted with new MTU 16V4000R41 engines by Brush Traction at Loughborough. The largest ECML train operator is First Capital Connect, using Class 317 and 365 electric multiple units for outer suburban services. Class 313 units cover inner suburban services, their dual voltage capability used on the city branch to Moorgate. Hull Trains has operated four Bombardier Class 222 four-car ‘Pioneer’ units and Grand Central started its Sunderland-London service with refurbished HSTs. The ECML has been seen as a front-runner for fitting the European Rail Traffic Management System (ERTMS), to be adopted on all 125mph routes under the European Interoperability Directives. This incorporates automatic train protection controls and trains receive in-cab signalling information from lineside transponders. Related to new stock, full resignalling and crossing replacements, full implementation could take up to 2020. Controlled from seven signal boxes and fully signalled with colour lights, most signalling was renewed when the line was electrified. The route is equipped for bi-directional running between Glasgow and Berwick-upon-Tweed. GNER became the first UK train company to offer uninterrupted Wi-Fi internet connections for all passengers, both first and standard class. The new franchise operator is committed to making this free in both classes and providing better on-board and station information systems, plus more electronic ticketing options that will extend to car parking. London’s King’s Cross railway station in London opened in October 1952. It is one of the terminal stations on the UK’s East Coast main line. Winning franchise bidder for a period from December 2007 until March 2015 was NXEC Trains Ltd, a subsidiary of National Express Group. Taking over management of 12 ECML stations, commitments for the service to be branded National Express East Coast include reduced journey times, £7.4m for station upgrades, a new two-hourly Lincoln-London service, rolling stock increases and refurbishments and a programme of environmental improvements. The future of the ECML’s southern terminus is also connected with it being part of London’s biggest transport interchange. Along with six London Underground lines, TfL bus services outside and the adjacent Midland mainline and Eurostar terminal St Pancras International, great changes will be brought to King’s Cross with the Thameslink programme revived under ‘Delivering a Sustainable Railway’. This will require the capability of handling 12-coach trains for the service, which will encompass Peterborough and Cambridge line trains and a range of destinations south of the Thames. The ECML will be the first line to see deployment of new trains to emerge from the IEP Intercity Express Programme, the project to replace the HST and Class 91/Mark 4 fleet from 2012 onwards. Assuming no short-term revision of the policy on main line electrification, this would mean diesel, electric and possibly hybrid versions on the route. Numerically less significant but commercially noteworthy, if Grand Central succeeds with its plans, this may lead to the first Chinese-sourced trains in the UK, the 140mph ‘Polaris’, adding to the ECML’s rich history.